Spanish I is continuing to read Tumba by Mira Canion. The teachers guide and audio book can be purchased here. Previous posts include introducing the novel & Chapter 1 - schools around the world. The day we read chapter 2, I asked the class if they would like to read it "Kindergarten style" sitting on the floor by by comfy chair. Their answer was a resounding sí!! I am not sure why I have not had Spanish I sit around Kindergarten style before. I think it may have to do with the fact that this class needs a lot of structure to stay focused and on task, so I usually read to them while they are in their seats. We have been missing out! For 8th hour Friday, they were Awesome while following along with their books sprawled out around the room, laying on a blanket on the floor, and using comfy chairs. I often forget about making sure to add novelty, and this is a prime example of letting go of that controlling nature and allowing them to relax. Having the students on the floor close to me meant high participation during questioning, and fewer distractions than sitting facing each other at the groups in tables. I do not want to do this every time, as it too would get stale, but it was a great reminder to mix it up! Chapter 2's dialogue and introduction of the bully, leads itself perfectly to acting out the scene through reader's theater. There are many very willing actors in this Spanish I class who love being in front of their peers. After reading, I asked for three volunteers to be our actors for this scene. There are many ways that you could do a reader's theater, including making scripts and having students practice and perform, narrating and having students just use motions, or a mix of both. Since we did not have a ton of time left in class, I read as the narrator and our three actors used their books to say their dialogue lines. Our actors even volunteered to play the parts that fit the descriptions in the book (an athletic boy for David and a self proclaimed bad boy/bully for Sergio). 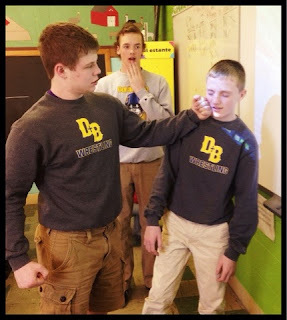 Our actors did a great job portraying the parts in the book, even though the bully took some creative liberties (fake punching his face instead of arm). This gave their classmates a visual representation of the book, as well as got in another repetition of the chapter in a new way. Monday we reviewed chapter 2 by working in partners to put printed and cut up events in order. They compared answered with other groups, and then came together to discuss our answers as a class. Now on to chapter 3! Any chance you could share your "Put the events in order" activity? Or is that from the teacher's guide. Gracias! Could you share the Chapter 2 ¨put the events in order" activity with me? sorry it is a purchased activity!